A fabulous men's Cartier Calibre Diver, model reference W7100055. 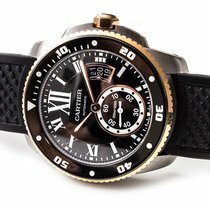 A steel and gold automatic diver's watch with black dial and turning gold bezel with black insert.Presented on a pristine rubber strap with pin buckle. Supplied by Bernhard Kamphues GmbH on 29th November 2014.